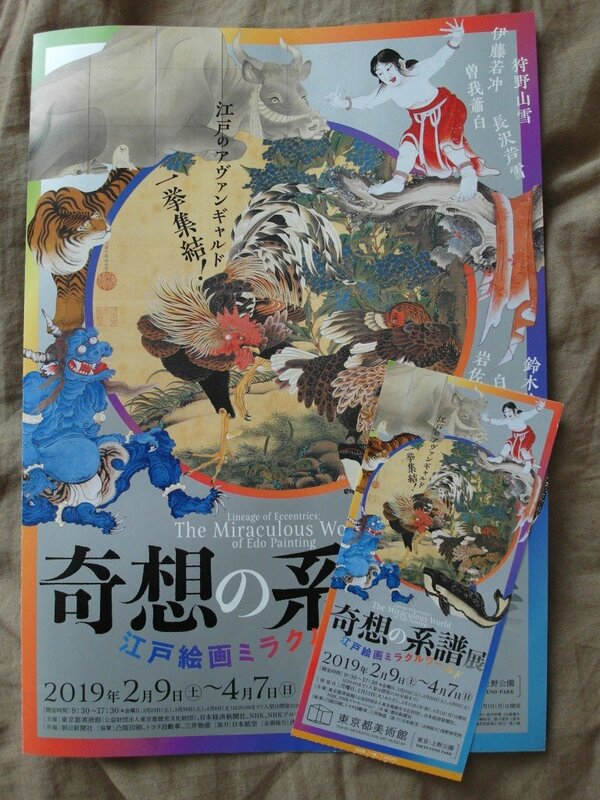 Today I would like to talk about the another great art exhibition in Tokyo I had an opportunity to enjoy, Lineage of Eccentrics: The Miraculous World of Edo Painting in Tokyo Metropolitan Art Museum. It is held from February 2nd to April 7th, so you can still make a visit if you get interested after reading this post! I learnt about this exhibition while I was at the previously mentioned, Hokusai Updated exhbition at Mori Art Gallery. I found a booklet with a familliar-looking painting of rooster and hen in the center. I immediately recognized the author of the work, one of my favorite Japanese artist, Itō Jakuchū. I look further into booklet and beamed with excitement when I saw the small replica of Jakuchū’s screen – Whale and Elephant, the another work from my private list of masterpices I want to see in this lifetime. That was the main trigger which quickly took me to the Ueno. 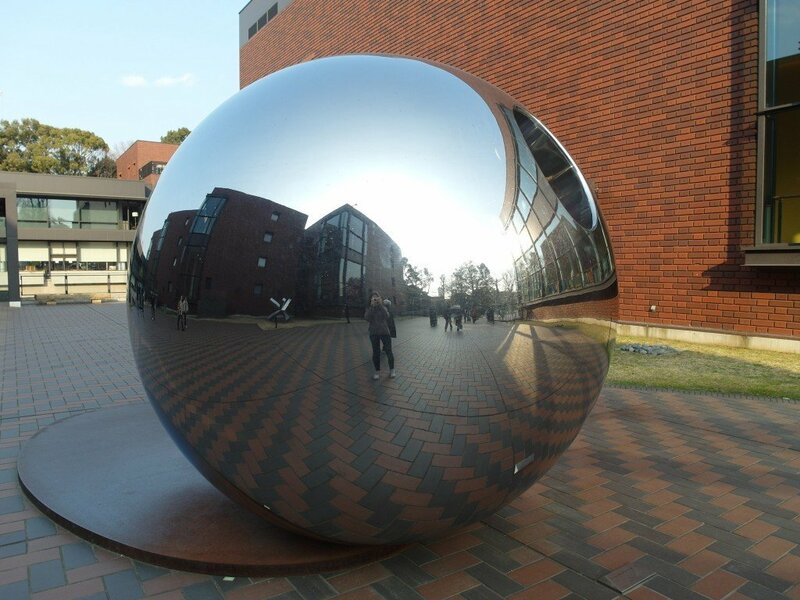 Before I knew I was standing before the Tokyo Metropolitan Art Museum, looking at my own reflection surronded by the Museum's architecture on the smooth surface of big metal ball. This surreal orb is a great invitation to every visitor showing your immersing to the world of art. Tokyo Metropolitan Museum history starts in 1921, when Sato Keitaro, a Kyushu industrialist, donates one million yen for the sake of founding the museum. Its year of founding, 1926, marked a About five years later, the museum first known as Tokyo Prefectural Art Museum was officially opened marking a transition from Taisho (1912-26) to Showa period (1926-89). It is worth to notice that Tokyo Prefectural Art Museum was the first public art museum in Japan! The main reason behind its founding was strongly connected with the nationalistic ideas of the beginning of Showa era and desire to not ''fall behind the West'' as it was perceived that ''in Europe, the art museum is a visible symbol of a city’s cultural identity''. Going back to the present, from February to the beginning of April, Tokyo Metropolitan Art Museum is showcasing the exhibition called Lineage of Eccentrics: The Miraculous World of Edo Painting. So what is behind this mysteriously sounding theme? The idea for the exhibition is based on the book Lineage of Eccentrics of art historian Tsuji Nobuo (born 1932), published almost a half of century ago. In his work, Tsuji introduced a group of artist who had never been comprehenslively featured in books or exhibitions and whose art works shared innovative, unconventional and surreal conceptions and way of expression. Nowadays, the painters whose art work where once unappreciated, became amazingly popular. The exhibition features works of six artists described by the Tsuji: Iwasa Matabei (1678-1650), Kanō Sansetsu (1590-1651), Itō Jakuchū (1716-1800), Soga Shōhaku (1730-1781), Nagasawa Rosetsu (1754-1799) and Utagawa Kuniyoshi (1797-1861) and adds two more - Hakuin Ekaku (1685-1768) and Suzuki Kiitsu (1796-1858) creating ''the new Lineage of Eccentrics''. All works were carefully selected to present the main idea of fascinating rich imagination of Edo (1603-1868) painters. I enormously enjoyed the exhibition. The selection of showcased art works is just amazing! The imaginative topics, fantastic beast and freely way of painting is what connect the presented pieces. I saw my beloved Whale and Elephant screen by Itō Jakuchū and fall in love in some other mastepieces like Kuniyoshi's Miyamoto Musashi Kills an Enormous Whale woodprint and Kanō Sansetsu Tiger and Dragon screens. Definitely recommend visiting the Lineage of Eccentrics exhibition!!! Go to Ueno using Keihin-tohoku line from Yokohama station. General admission to exhibition costs 1600 yen. I am an ordinary girl from small town in far away land of Poland, which tale is rather extraordinary, as no ending curiosity of the world got me to the Japanese Islands.